Hubby Pete and I live in lovely Houghton Lake, Michigan (largest inland lake in the state!) with our 2 dogs, cat, and 6 parrots. We are Christians, very involved with our church, and also grandparents, very involved with our family. I am a keyboardist and play for church and for my own pleasure. We have recently purchased a "starter" class A and hope that we enjoy it so much that we can go full-time in the next year or so. I'm a musician, and a creative and great low-carb cook. Pete can fix almost anything he touches. We've both been computer geeks since the mid-90's. We just purchased (May, 2015) our first motorhome, a 1996 Challenger. 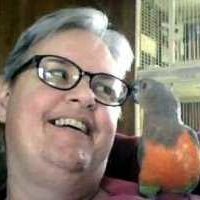 We are in the process of doing the TLC that it required and making modifications for our parrots, and hope to take our first trip this month (July, 2015).